Last week, healthcare influencers, entrepreneurs, and members of the digital health community gathered at the Seaport World Trade Center to attend the Connected Health Conference and focus on the current state of digital health and the future of the industry. Here are some of our biggest takeaways from our events. Last week, our team hosted a pre-conference with the Digital Health Collaborative, where members of the community gathered to discuss innovation and digital health. Throughout the day, panelists and speakers emphasized the importance of leveraging existing resources to fuel health innovation and promote regional growth. Additionally, startups play a key role in driving innovation in the health ecosystem. Although they are needed to cause disruption to healthcare, they can’t work alone. 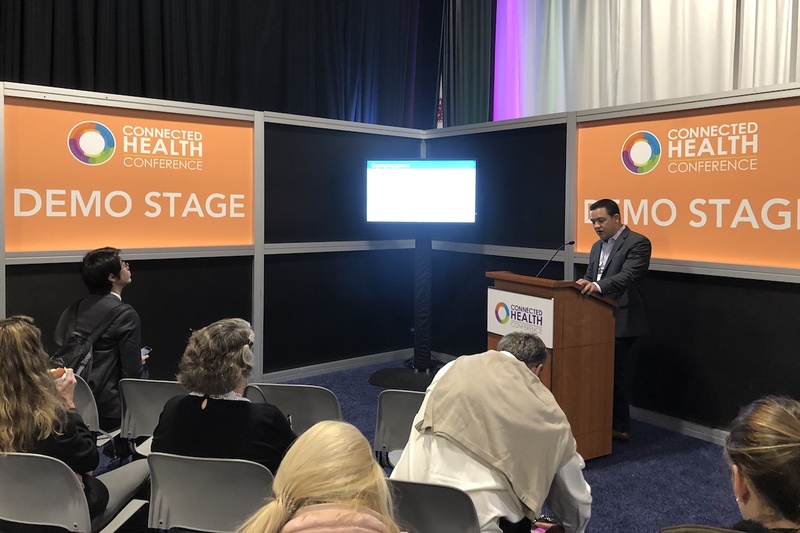 During the Connected Health Conference, Adeel Yang, CEO of Medumo, spoke at the “Accelerating Companies through Partnerships” fireside chat, where he discussed how his company accelerated through innovative partnerships. “At the beginning, Medumo was a pre-seed 4 person team. Now, we are a 30+ person team with $3M+ in funding,” Yang said during the conference session. Medumo also secured five paying health systems by the end of the first MassChallenge HealthTech program and over twenty by the end of the second program. Yang also advised future entrepreneurs and innovators to be open-minded to change when partnering with industry organizations. Sunita Patolia, Simone Orlowski, and Sunetra Bane of Partners Connected Health led an engaging and interactive session on design thinking during our event with the Digital Health Collaborative. This session was important because the Partners Connected Health team highlighted the importance of collaboration and active listening when working together. They also spoke about the importance of design thinking as a driver for change in health, if used correctly. Nick Dougherty, Managing Director of MassChallenge HealthTech spoke about his efforts to create a national standard for security assessments with the Digital Health Collaborative alongside leaders such as David Barnett of Corsis, Paige Goodhew of Redox, Santosh Mohan of AthenaHealth, Dr. Adam Landman of Brigham and Women’s Hospital, and Michael Pandolfi of Massachusetts General Hospital, and more. The community of stakeholders realized that the security assessment was a barrier to innovation for startups and organizations because they’re different in format and content, therefore creating issues. During the conference, the collaborative shared their progress report, where they are seeking input from various healthcare stakeholders, such as startups, chief technology officers, and CISOs. After the conference, they hope to continue their efforts towards developing a strong standard that will reduce any barriers for startups and organizations. Dr. Kevin Fickenscher of CREO Strategic Solutions, Michael Hodgkins of the American Medical Association, and Dr. Ami Bhatt of Massachusetts General Hospital participated in a panel about technology, collaboration, and health innovation. One highlight from the session featured the discussion around physicians and health innovation. Dr. Bhatt described the work her team is conducting to improve physicians’ user experiences with emerging technologies such as virtual visits and consults. She sees this as a key driver of innovation in health to improve the patient experience, but commented that physicians need to be onboard. To drive innovation, key stakeholders are needed resources to support growth. Last week, Meg Barron, Michael Hodgkins, and Stacy Lloyd of the American Medical Association announced the launch of the digital health implementation playbook. The AMA’s goal for creating this resource was to guide startups and entrepreneurs throughout the health ecosystem so that they can work to innovate and drive impact. Stephen Konya of the Office of the National Coordinator for HealthIT, co-founder of the Digital Health Collaborative, discussed an ongoing effort to map the nation’s health ecosystem during the Connected Health Conference. Throughout the conference, Konya emphasized that the development of this resource would benefit anyone within the health ecosystem, as the end project would map the location of any healthcare stakeholder such as accelerator program, membership network, government agencies, and more. Stuntz shared his vision for the digital health marketplace program. Stuntz said, “with the marketplace program, we hope to create collaboration opportunities, facilitate startup-customer connections, and develop growth of the digital health industry in Massachusetts.” Finally, he hopes that this initiative will help the Commonwealth to become the leading digital health ecosystem in the world. After the adoption of the Google Voice, Amazon Alexa, and other emerging technologies, those in healthcare are starting to apply these innovation solutions to healthcare, and it seems that it is only the beginning. Boston Children’s Hospital organized the Voice.Health Summit at the Connected Health Conference, where discussions focused on the potential impact of voice in health, focusing the patient-physician experience and improving patients’ daily lives. During the Rapid Fire Presentation series, we heard from various startups and organizations who are looking to drive health innovation using voice technology. For example, Debbie Hays from DeloitteHealth is excited about using voice technology to optimize patient care and improve operational efficiency. Sara Smollet of VoiceItt plans to drive innovation and improve speech recognition with her company’s technology. Furthermore, Stacey Ulacia of Seattle Children’s hospital described her work she has been doing with Boston Children’s Hospital to increase patient trust in the flu vaccine. We also heard from Nathan Treloar, President of Orbita, who announced plans to collaborate with Brigham and Women’s Hospital Innovation Hub to impact health through AI and voice technology. It seems that voice technology is only here to stay in healthcare, and it will be exciting to see what the future will look like. Change doesn’t come easy in an industry that is slow to adapt, but collaboration and emerging technologies are key to accelerating innovation.